Friday night I was downtown at Here to see The Best of Everything. The space at Here means a lot to me because 20 years ago my comedy partner, Jay, and I spotted a Ferris wheel in the middle of a cobblestone street. We had stumbled upon an art opening for this performance space at Here. That night, we shot funny interviews on Hi-8 with downtown artists and called the 30-minute documentary The Big Apple Jam. It aired several times on Manhattan Neighborhood Network. So there I was the other night at Here. Again I happened upon something magical. New York City lends itself to synchronicity. You can wander downtown streets and happen upon a gem of a play like The Best of Everything. I learned about the show from a tweet or email sent by Holly Rosen Fink who’d auditioned me for the Listen to Your Mother Mother’s Day performance (which I didn’t get). Fink was the associate producer of the play, based on the novel with the same name by Rona Jaffe, written by Julie Kramer and directed by Amy Wilson, who also plays my favorite character, Miss Farrow. 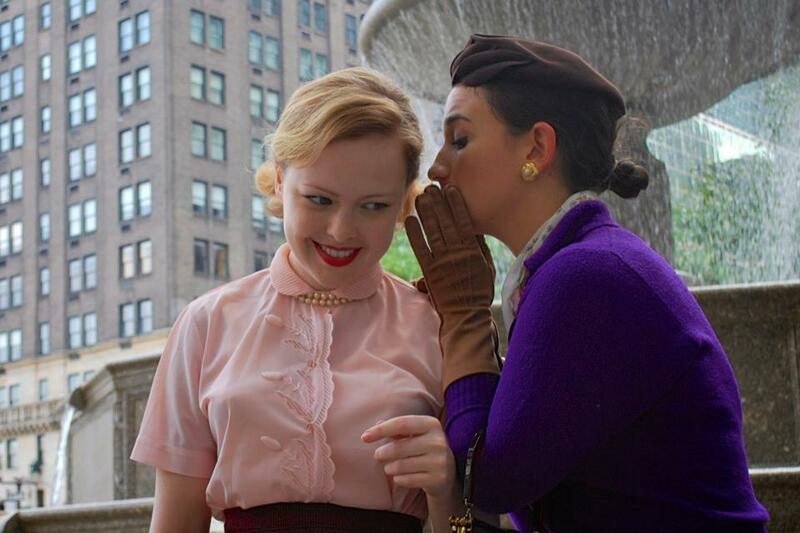 The play’s about the twisting fates of secretaries for a publishing house in the 1950s. Each of the secretaries could have a whole sitcom created for her. So funny. I laughed a lot but then I cried a little too. And why I cried surprised me. It wasn’t the tragic outcome of one of the secretary’s obsession with a no-good man. I kind of saw that coming. Or another character’s discussion of her necessary abortion at this time of illegal abortions. I got choked up because I love authors and I love editors and I love that the editor cared about her authors. In some screwed-up way, the older woman, Miss Farrow, wanted to mentor the younger woman. Deep down, the women all wanted each other to succeed. Beneath Miss Farrow’s bitchiness seemed to be her genuine affection for her mentee. I have felt that too: while women can be competitive and enemies in the workplace, they can also be one another’s sponsors and help each other move ahead. Beneath Caroline’s insecurity was her quiet confidence; she asked Miss Farrow to help her achieve decent pay. I like that. The play left me thinking, beyond the colliding worlds of wives at home and women in the office, how can women be sexual human beings? The men who philander land on bar stools while the women fall down stairs or require back-alley abortions. It’d be fun to discuss how women’s sexuality and society’s moralizing drove behavior in the 1950s workplace and how that compares with today. In any case, the show moves at a clip. The costumes and the music are delicious. When I walked out of the theater into the downtown scene, I thought, Thank God I wasn’t a working gal in the 1950s. Although, some things never change, like the magic of Off Off Broadway. And that happens Here. Check it out at Best of Everything or find out what’s next at Here Arts Center.